Many people remember their childhood as an enchanted time. I don’t remember mine that way at all. I remember childhood as mostly happy, but not magical in any way. I had my share of fanciful notions. I believed in Santa Claus, the Easter Bunny, the Tooth Fairy and the Boogie Man. I thought the nighttime insect chirpings were the sound the stars made as they shone. I was afraid of the dark, big dogs, mean teachers and big, mean boys. But, mostly, my childhood seemed concrete and prosaic. The predominant feeling was that the world made sense and I could master it. I was a curious, sensitive, energetic little girl and my childhood was a perfect preparation for a life of action. Like most children in the 1960s, I spent most of my time outdoors. From the age of 4, I was allowed the run of our block, and by the time I was 8 I had the run of our neighborhood on my bike. There were usually other kids to play with, or I would just wander by myself in the woods at the bottom of our hill, feeling like the first person ever to discover the valleys and woodland wildflowers and the little stream. There were two very large families in our neighborhood and the children of these families dominated and bullied the rest of us. Social skills were survival skills in that environment, and we learned them pretty quickly. We learned to decide when to submit, when to fight back, and when to form alliances – and what it felt like both to betray and be betrayed. I also learned to get on my bike and seek more congenial friends further afield. We were taught at school by dour, no-nonsense, mostly middle-aged, teachers who did not spare the rod. We learned mostly by rote: how to spell, how to read, how to do arithmetic, the rules of grammar and later the rules of science. There was little notion that learning should be fun or entertaining, and group learning would have been considered a form of cheating. We were well-prepared for a work world that was already rapidly disappearing by the time we reached adulthood: a world where you did what you were told and did the same thing every day for 40 years. I rarely had trouble sleeping and was hardly ever sick after my tonsils came out. Middle-class food in the 1960s was pretty plain and unexciting, and I was usually too busy playing to take much time to eat. So, I wasn’t a big eater, but I was a fast eater. I didn’t mind being dirty. It didn’t bother me to go to bed with dust on my legs, dirt under my fingernails, with my arms and legs stinging from cuts and bites. I was a healthy little animal, nothing enchanted at all, happily fit for a human life. I’d love to hear from my readers about whether you feel like your childhood felt enchanted. What era did you grow up in? How did childhood feel to you. Leave a reply on the site. 1. In honor of my lifelong passion for reading, I donated 5 children’s books to the Grow Up Great book drive at work. 2. I took my mom out to lunch and told her what a great mom she’d been, how she had influenced me, and how her good example has broadened to the people whose lives I’ve influenced. We both cried. 3. My mom and I took a field trip to the apartment building where she & my dad lived for the first 4 years of their marriage and the first 3 years of my life. My mom told me some funny stories about myself as a child (for example: I was a 2-year-old shoplifter. Did I steal candy like any normal child? No. I took a book. Of course). We both cried again. 4. I did a bunch of things things that I enjoyed doing as a child. I went sled riding, I took walks in the woods, I re-read my favorite childhood books, and, geekiest thing of all, Al and I went to the town in Minnesota where my favorite childhood books were set. My very favorite books were the Betsy-Tacy series, by Maud Hart Lovelace. The books were based on her own childhood in Mankato and you can go there and still see many of the sites mentioned in the book. Betsy’s and Tacy’s houses have even been turned into a little museum, which was my idea of heaven. See pictures below. 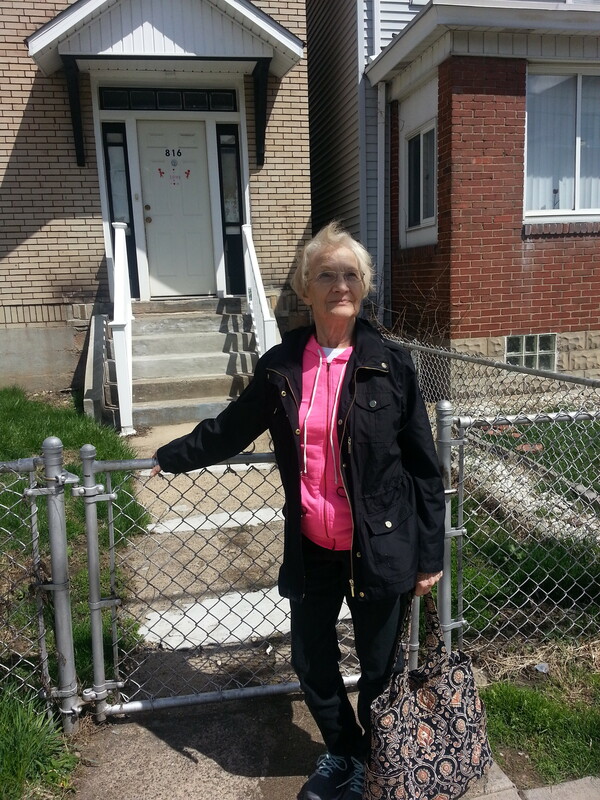 Here’s my mom in front of the apartment building where she spent her newlywed years. My dad’s grandfather owned the building at the time. My dad had lived there with his grandfather when he was in college and later lived there by himself as a bachelor. This is where I lived until I was 3, when my parents bought the house my mom lives in now. 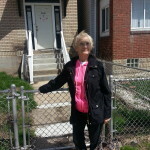 Here I am in front of my shrine, Betsy’s house. It is restored to look as it did in 1897, the year the series begins. We also visited other locations from the stories that are still standing, such as the old Carnegie Library and other friends’ houses from the books. I loved these books because of the warmth of family life and friendship that they portrayed, the lively characters and the great historical detail about what they wore, what they ate, etc. I’ll have a couple more childhood blog posts coming up, and then it will be on reading my diaries from my teenage years, all of which I still have.